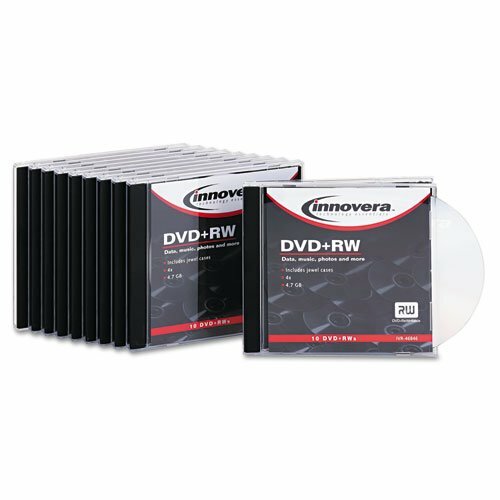 Innovera DVD+RW Discs, 4.7GB, 4x, w/Slim Jewel Cases, Silver, 10/Pack Rewritable disc offers incredible flexibility and convenience. DVD+RW technology allows users to record, read and erase on the same disc. High capacity makes it the ideal media for use in graphics and advertising, software development, video recording, and more. Durable disc can be rewritten up 1,000 times. Easy to write on surface for quick, clear labeling. Includes durable jewel case to protect disc when not in use. Disk Type: DVD+RW; Capacity (Video): 120 min; Recordable Format: Rewritable format--may record and re-record data up to 1,000 times. ; Capacity Range (Data): 4.7 GB. High capacity. Manufacturer's limited one-year warranty.